This recipe is an excellent source of niacin, vitamin B6, vitamin B12, selenium and zinc; and a good source of fiber and iron. 1. To prepare pesto, place arugula, almonds, garlic, lemon juice and lemon peel in food processor container. Cover; process until finely chopped. With motor running, slowly add oil through opening in cover, processing until smooth. Season with salt and pepper, as desired. Remove and reserve 1/4 cup pesto for serving; cover and refrigerate. 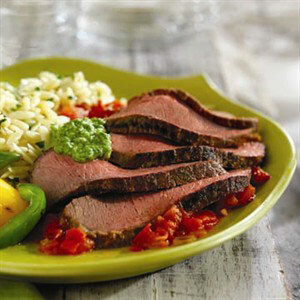 Place beef steak and remaining pesto in food-safe plastic bag; turn steak to coat. Close bag securely and marinate in refrigerator 6 hours or as long as overnight, turning occasionally. 2. Heat 1 tablespoon oil in large nonstick skillet over medium heat. Add onion; cook and stir 4 to 5 minutes or until tender. Add tomatoes; cook 8 to 10 minutes or until most of liquid has evaporated, stirring occasionally. Stir in vodka; cook 7 to 10 minutes or until thickened, stirring frequently. Season with salt and pepper, as desired. Cool to room temperature. 4. Carve steak into thin slices. Serve over vodka-tomato sauce; Top with reserved Arugula Pesto. Garnish with cheese, if desired. Vodka-tomato sauce may be made up to 24 hours ahead; cover and refrigerate. Bring to room temperature before serving. One 28-ounce can whole tomatoes may be substituted for fresh tomatoes. Reserving juice, chop tomatoes. Add chopped tomatoes and juice to onion mixture and cook as directed above.